Listen to "Pride and Predjudice" on your iOS and Android device. A full-cast stage adaptation of Jane Austen’s classic novel. The dour, Mr. Darcy is anything but popular with the Bennets, especially when he fancies a member of their clan. And as Elizabeth reluctantly deals with Mr. Darcy’s advances, their romance seems destined to fail. Jane Austen’s Pride and Prejudice set the standard for romantic comedies when it debuted in 1813, and it still speaks to audiences worldwide through countless adaptations. Includes a roundtable interview with the entire cast. 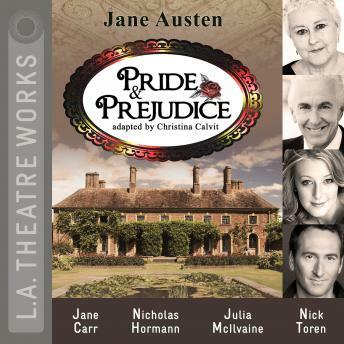 Jane Carr as Mrs. Bennet and Lady Catherine; alongside Diane Adair, Nicholas Hormann, Chloe Dworkin, Cerris Morgan-Moyer, Jill Renner, and Darren Richardson. Adapted for the stage by Christina Calvit. Directed by Brian Kite. Recorded by L.A. Theatre Works before a live audience. It was an easy listen and funny. I wish it was longer and less of the audience laughing. It’s like listening to a play and all the characters have different voices.